Discussion in 'United States at Sea!' started by Dave War44, Dec 20, 2006. When the U-boats were at their worst in World War I, the British Admiralty approved and authorized the conversion of merchant vessels to heavily armed raiders which would have her guns disguised or concealed in such a way that the merchant vessels might serve as decoys which would encourage U-boats to attack them. Then, provided the disguised merchant vessel had been given sufficient buoyancy, so that one or two torpedoes would be unable to sink her, the disguise was to be thrown off, the guns brought to bear, the U-boat sunk. The entire effectiveness of the enterprise depended on the successful use of surprise, and once the U-boats were aware of the ruse, the chances of success were so greatly reduced that only a few ingenious Commanding Officers were able to conduct Q-ship campaigns throughout the remainder of World War I with any distinction. Along with her sister USS Asterion, USS Atik was the very first of the American Q-Ships. They were former cargo ships of 3,209 tons, 318 feet in length, and were armed with four 4-inch-fifty calibre guns, four .50 calibre machine guns, six single depth charge throwers and a miscellaneous collection of small arms. Their holds were packed with pulpwood to ensure maximum floatability in the event of a torpedo strike. Again, the hope was that on sighting a lone, lumbering, seemingly defenceless ship, a U-Boat commander would decide to surface and attack with its deck gun, rather than wasting valuable torpedoes unnecessarily. However, three days into its first cruise as a Q-Ship, the Atik was attacked and sunk by a U-Boat. The Q-Ship had attracted the attention of U-123, on her second war patrol off the eastern seaboard. The U-boat, on the surface, began stalking Atik at 1700, and at 1937 fired one torpedo from 700 yards away which struck the ship on her port side, under the bridge. Fire broke out immediately, and the ship began to assume a slight list. Because such attacks were a regular occurrences at this time and because all available surface craft were on patrol the emergency radio dispatch from Atik produced no immediate action. The Duty Officer in the Control Room had not been informed as to the secret nature of Atik, and consequently his only action was to forward the dispatch to Commander-in-Chief, United States Fleet. But Atik was not out of the fight. After U-123 turned to starboard, Atik gathered steerage way, paralleling her course by turning to starboard as well, and dropped her concealment, commencing fire from her main and secondary batteries. The first shell dropped short of the U-boat, as she made off presenting a small target; the others were off in deflection. A hail of .50-caliber machine gun fire, though, ricocheted around the U-boat's decks as she bent on speed to escape the trap into which Hardegen had fallen. 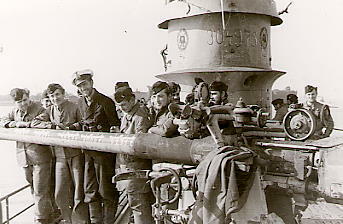 One bullet mortally wounded a midshipman standing watch on U-123's bridge. Gradually, the U-boat pulled out of range behind the cover of a smoke screen emitted by her straining diesels, and her captain assessed the damage. As he later recorded, "We had been incredibly lucky." Once again, Atik 's crew could be seen embarking in her boats, as their ship clung stubbornly to the surface. U-123 surfaced at 2227, confident that Atik was no longer a threat, and continued to watch until 2250 when a cataclysmic explosion blew Atik to pieces. Ten minutes later, U-123 buried her only casualty -- the midshipmen killed by Atik's machine gun fire. Atik 's entire crew perished -- either in the blast or during the severe gale that blew up soon after the ship disintegrated. The most formidable of the American Q-ships was the tanker SS Gulf Dawn, selected by Commander Eastern Sea Frontier after the Commander In Chief had approved his proposal for using a disguised tanker. Conversion was begun in March 1942 at a Brooklyn shipyard and was continued at the Navy Yard Boston, where the work was finally completed in July of that year. Equipment included five 4-inch .50 caliber single purpose guns, two .50 calibre machine guns, five "Tommy" guns, five sawed-off shotguns, one Model JK-9 listening equipment. Later, mousetrap and hedgehog weapons were installed. She was commissioned USS Big Horn and the Commanding Officer assigned was Commander J. A. Gainard, formerly master of the SS City of Flint, which became the centre of an international incident at the beginning of the war, and was later sunk by a U-boat. After one or two uneventful cruises, the most significant action involving the Big Horn took place on 3rd May, 1943. Early that morning, a surfaced vessel had been sighted on the horizon, and coastal patrol boat PC-618 was sent in pursuit. At 1104, PC-618 reported a submarine on the surface, distant about 6 miles. At 1235, the Big Horn got a sound contact and delivered a hedgehog attack just after sighting a periscope on the starboard bow at 1242, followed by a heavy swirl as the U-boat dove. At 1333 a second attack was delivered and the contact was lost. At 1540 the contact was regained at 3700 yards and at 1554, speed 5 knots, the Big Horn delivered a third attack. About five of the hedgehog projectiles exploded after they struck the water, and the Big Horn continued in to drop depth charges. Considerable light oil came to the surface and continued to spread for two hours. At 0103 on May 4th an oil patch was visible over an area of 200 to 300 yards. By daylight that morning, all traces of the oil slick were gone. As none of the vessels in the Group were able to establish contact during the next 44 hours, it was presumed that one submarine had been destroyed; that the other U-boat which had been sighted by the coastal patrol boat had moved cut of the area. "It may be noted that during the period from 27 November to 1 December, this Task Group was in the midst of a group of from 10 to 15 U-boats. Nine contacts, sightings or attacks on U-boats took place in our immediate vicinity, so that it is most unlikely that we were not seen by some U-boats. Evidently the U-boats are wary of attacking an independent tanker. If the Q-ship program has contributed to this wariness, as is suggested in several prisoner-of-war statements, many independent merchant ships may thereby have escaped attack, and the Q-ship program has thus been of value." NavSource archives and Uboat.net for some of the photos. Wikipedia and Naval Historical centre for the bulk of the text. Brilliant photos mate. A very good find. Some-one with a wry sense of humour must have named her "Big Horn"
Lol yes Jamie, and thanks. I remember doing the thread well, I thought it would take me about half an hour, in the end it took me 3 days off and on ! I was juggling photos and text from all over the web and trying to put it into my own words. By the end I was sick to death of Q Ships !